Between the advent of railway travel and telegraphic communication in the middle of the 19th century and the establishment of standardized time zones in the 1880s, newly mobile people trying to do business from a distance were confounded by a wide array of local times. Charts like this one, which were intended to help, now show us how utterly confusing everything was. The chart, which is from the 1874 version of Johnson’s New Illustrated Family Atlas (published in New York), uses Washington, D.C., as its standard. The clocks radiating outward are arranged in concentric circles, with Latin American cities on the interior, large European and Asian cities next, and American and Canadian cities and towns occupying the outer rings. Because locations established time based on local readings of the sun and the phases of the moon, even towns as close together as Galveston and Austin, Texas, (located at about the 8 o’clock location on this chart) ran an annoying 11 minutes apart. In 1883, North American railroads switched to Standard Railway Time, and American cities followed suit. The International Meridian Conference established worldwide time zones a year later. 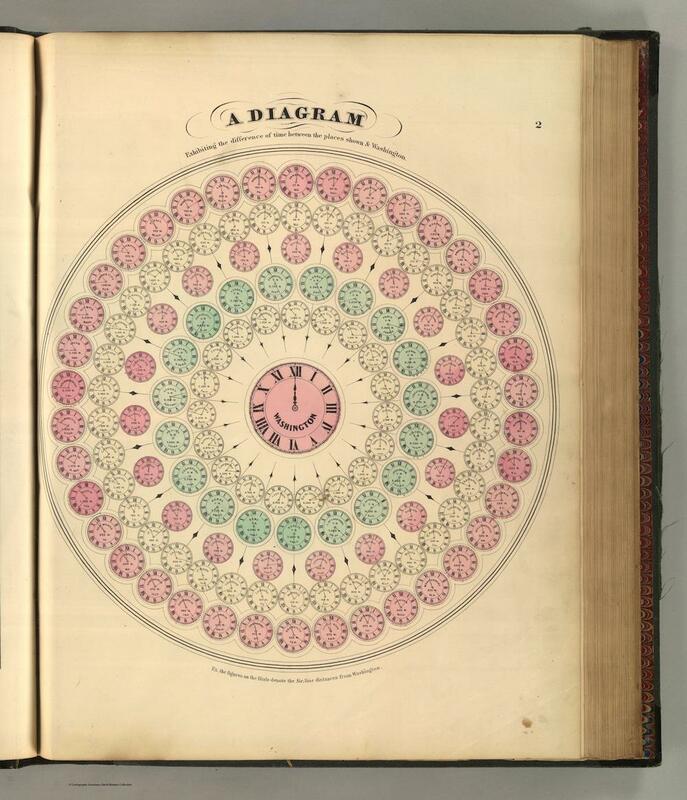 Thanks to John Ptak, who recently featured this diagram on his blog, along with a few other pre–time-zone clock charts that are equally beautiful. Click on the image below to reach a zoomable version, or visit the chart’s page on the David Rumsey Map Collection website. “A Diagram exhibiting the difference of time between places shown and Washington.” Johnson’s New Illustrated Family Atlas of the World, A.J. Johnson, 1874.